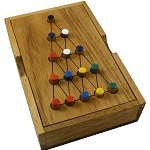 4 ¼" x 3 1/3" x 1"
This special wooden brain teaser puzzle was first created in the 1930's. Great puzzle for a long travel. 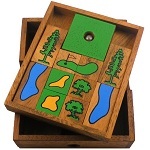 The object of the game is to slide the biggest square from the middle top, to the middle bottom. It has 9 different solutions to choose from.The easiest solution can be done with 18 moves when the most difficult needs at least 101 moves. 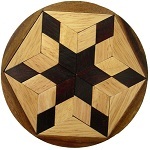 A great price for this wonderful puzzle.